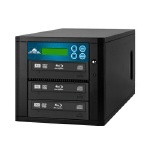 Optional PC Connect: Pro CD Duplicators are available with a factory-installed connection to PC or Mac using an optional FireWire (IEEE 1394) or USB 2.0 Interface for Mastering, which connects to the bottom recorder. 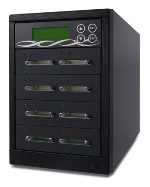 The CopyWriter Rackmount is Microboards' multi-drive DVD-R/CD-R duplicator employing the use of General Purpose 24x DVD or 48X CD recorders. 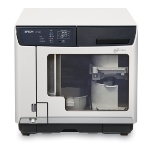 The unit supports both standalone and optional computer-connect operation and allows you to copy from multiple DVD formats. 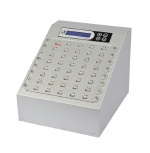 An intuitive, menu-driven display and 2-button control interface provide simple one-touch operation for the novice user while giving access to advanced features for the professional. 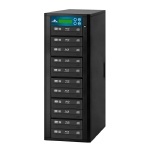 The hard drive comes standard with the system and allows the user to archive CD and/or DVD images or perform CD track extraction for CD audio compilations. Content protection makes it impossible to copy encrypted entertainment titles on general purpose media. Check out our DVD FAQ for more information.